On 5 May 1953 the novelist Aldous Huxley dissolved four-tenths of a gram of mescaline in a glass of water, drank it, then sat back and waited for the drug to take effect. Huxley consumed the drug in his California home under the direct supervision of psychiatrist Humphry Osmond, to whom Huxley had volunteered himself as a willing and eager guinea pig’. Osmond was one of a small group of psychiatrists who pioneered the use of LSD as a treatment for alcoholism and various mental disorders in the early 1950s. He coined the term psychedelic, meaning ‘mind manifesting’ and although his research into the therapeutic potential of LSD produced promising initial results, it was abruptly halted in the following decade as part of the backlash against the hippy counterculture. Osmond was born in Surrey in 1917, and studied medicine at Guy’s Hospital, London. He served in the Royal Navy as a ship’s psychiatrist during World War II, and afterwards worked in the psychiatric unit at St George’s Hospital, London, where he became a senior registrar. While at St George’s, Osmond and his colleague John Smythies learned about Albert Hoffman’s synthesis of LSD at the Sandoz Pharmaceutical Company in Basle, Switzerland. Osmond and Smythies started their own investigation into the properties of hallucinogens and observed that mescaline produced effects similar to the symptoms of schizophrenia, and that its chemical structure was very similar to that of the hormone and neurotransmitter adrenaline. This led them to postulate that schizophrenia was caused by a chemical imbalance in the brain. These ideas were not favourably received by their colleagues. In 1951 Osmond took a post as deputy director of psychiatry at the Weyburn Mental Hospital in Saskatchewan, Canada and moved there with his family. Within a year, he began collaborating on experiments using LSD with Albert Hoffer. Osmond conducted experiments on himself with LSD and concluded that the drug could produce profound changes in consciousness. Osmond and Hoffer also recruited volunteers to take LSD and theorised that the drug was capable of inducing a new level of self-awareness that may have enormous therapeutic potential. Osmond and Hoffer were encouraged, and continued to administer the drug to alcoholics. By the end of the 1960s, they had treated approximately 2000 patients. Osmond and Hoffer claimed that the Saskatchewan trials consistently produced the same results – their studies seemed to show that a single large dose of LSD could be an effective treatment for alcoholism, and reported that between 40 and 45 per cent of their patients given the drug had not experienced a relapse after a year. Meanwhile in Canada Osmond’s form of LSD therapy was endorsed by the co-founder of Alcoholics Anonymous and the director of Saskatchewan’s Bureau on Alcoholism. LSD therapy peaked in the late 1950s and early 1960s, and was widely considered to be ‘the next big thing’ in psychiatry, which could supersede electroconvulsive therapy and psychosurgery. At one point, it was popular among Hollywood superstars, such as Cary Grant. Two forms of LSD therapy became popular. One, called psychedelic therapy, was based on Osmond and Hoffer’s work, and involved a single large dose of LSD alongside psychotherapy. Osmond and Hoffer believed that hallucinogens are beneficial therapeutically because of their ability to make patients view their condition from a fresh perspective. The other, called psycholytic therapy, was based on Sandison’s regime of several smaller doses, increasing in size, as an adjunct to psychoanalysis. Sandison’s clinical observations led him to believe that LSD can aid psychotherapy by inducing dream-like hallucinations that reflected the patient’s unconscious mind and enabling them to relive long-lost memories. Between the years of 1950 and 1965, some 40,000 patients had been prescribed one form of LSD therapy or another as treatment for neurosis, schizophrenia and psychopathy. It was even prescribed to children with autism. Research into the potential therapeutic effects of LSD and other hallucinogens had produced over 1000 scientific papers and six international conferences. But many of these early studies weren’t particularly robust, lacking control groups, for example, and likely suffered from what researchers call publication bias, whereby negative data are excluded from the final analyses. Even so, the preliminary findings seemed to warrant further research into the therapeutic benefits of hallucinogenic drugs. The research soon came to an abrupt halt, however, mostly for political reasons. In 1962 the US Congress passed new drug safety regulations, and the Food and Drug Administration designated LSD as an experimental drug and began to clamp down on research into its effects. The following year, LSD hit the streets in the form of liquid soaked onto sugar cubes; its popularity grew quickly and the hippy counterculture was in full swing by the summer of 1967. During this period, LSD increasingly came to be viewed as a drug of abuse. It also became closely associated with student riots and anti-war demonstrations, and thus was outlawed by the US federal government in 1968. Osmond and Hoffer responded to this new legislation by commenting that ‘it seems apt that there is now an outburst of resentment against some chemicals which can rapidly throw a man either into heaven or hell’. However, they also criticised the legislation, comparing it to the Victorian reaction to anaesthetics. The 1990s saw a renewed interest in the neurobiological effects and therapeutic potential and hallucinogenic drugs. We now understand how many of them work at the molecular level, and several research groups have been performing brain-scanning experiments to try to learn more about how they exert their effects. A number of clinical trials are also being performed to test the potential benefits of psilocybin, ketamine and MDMA to patients with depression and various other mood disorders. Their use is still severely restricted, however, leading some to criticise drug laws, which they argue are preventing vital research. Huxley believed that hallucinogenic drugs produce their characteristic effects by opening a ‘reducing valve’ in the brain that normally limits our perception, and some of the new research seems to confirm this. In 1963, when he was dying of cancer, Huxley famously asked his wife to inject him with LSD on his deathbed. In this, too, it seems that he was prescient. Several small trials suggest that ketamine can effectively alleviate depression and anxiety in terminally ill cancer patients and, more recently, the first American study to use LSD in more than 40 years concluded that it, too, reduces anxiety in patients with life-threatening diseases. Eventually, allowing researchers to investigate these drugs could not only reveal their true therapeutic potential, but could also help them to gain a better understanding of how they produce their effects, and of how the brain works. Dyck, E. (2006). ‘Hitting highs at rock bottom’: LSD treatment for alcoholism, 1950–1970. Social History of Medicine, 19, 313–329. Dyer, C. (2002). NHS settles claim of patients treated with LSD. British Medical Journal, 324, 501. Gasser, P., Holstein, D., Michel, Y. et al. (2014). Safety and efficacy of lysergic acid diethylamide-assisted psychotherapy for anxiety associated with life-threatening diseases. Journal of Nervous and Mental Disease [Advance online publication]. Huxley, A. (1954). The doors of perception. London: Chatto & Windus. Irwin, S.A., Iglewicz, A., Neleson, R.A. et al. (2013). Daily oral ketamine for the treatment of depression and anxiety in patients receiving hospice care: A 28-day open-label proof-of-concept trial. Journal of Palliative Medicine, 16, 958–965. Sandison, R. (2001). A century of psychiatry, psychotherapy and group therapy. London: Jessica Kingsley Publishers. Sandison, R.A., Spencer, A.M. & Whitelaw J.D.A. (1954). 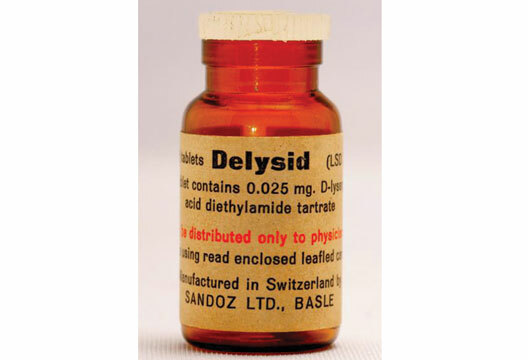 The therapeutic value of lysergic acid diethylamide in mental illness. Journal of Mental. Science, 100, 491–507. Sandison, R.A. & Whitelaw, J.D.A. (1957). Further studies of the therapeutic value of lysergic acid diethylamide in mental illness. Journal of Mental Science, 103, 332–343. Sessa, B. (2008). Can psychedelic drugs play a role in palliative care? European Journal of Palliative Care, 15, 235–237. Smart, R.G. & Storm, T. (1964). The efficacy of LSD in the treatment of alcoholism. Quarterly Journal of Studies on Alcohol, 25, 333–338. Journal of Studies on Alcohol, 19, 406–417. Tanne, J.H. (2004). Humphrey Osmond. British Medical Journal, 328, 713.